Save big on deals on great phones from US Cellular. Deals going up to 50% off on premium iOS and Android phones. Exp. Dec 31, 2019. US Cellular: FREE Shipping on all online phone purchases! Order your next cell phone from US Cellular and enjoy Free Overnight Shipping on all orders! Exp. Dec 30, 2019. Switch to Sprint and shop their current deals! Free activation when you buy online | save $30! Exp: Jan 31, 2019. Get your next new smartphone from Verizon Wireless and enjoy a $50 discount off your purchase. Offer valid while stocks last. Enter code VZWDEAL to receive your discount. Exp. July 31, 2018. The stylish Samsung Galaxy J7 represents the new generation of mid-range smartphones. With an expansive 5.5-inch display, a sturdy metal frame, a 1.6GHz Octa-core processor and all the features you will love - the Galaxy J7 is too good for the price. You may think of the Samsung Galaxy J7 as a bigger and more powerful version of the lower-end Galaxy J3. Several variants of the Samsung Galaxy J7 exists, named differently. We have the Galaxy J7 Perx for Sprint Wireless, Galaxy J7 V for Verizon Wireless Postpaid, and the plain named Galaxy J7 for Republic Wireless, US Cellular, and Verizon Prepaid. We are currently using the version from Verizon Wireless Prepaid. Let's check out more details as we go along with the review. 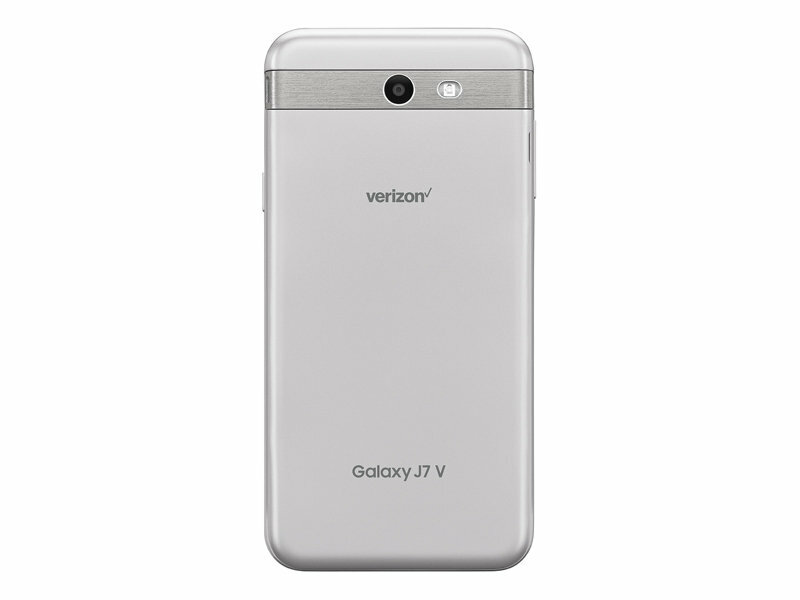 The Samsung Galaxy J7 is available from Republic Wireless, US Cellular, Sprint, and Verizon Wireless. Samsung appreciates their customers with a beautiful packaging of their phones. The Samsung Galaxy J7 comes in a nice packaging which includes the gadget, a pair of headsets, a standard USB cable, wall adapter, battery, service guide and a quick setup guide. The Samsung Galaxy J7 comes with a premium exterior design. It's a typical design of Samsung smartphones; slightly rounded corners and a metallic strip around the edges. Even though the back panel is plastic, the metal frame carries the modern appearance of flagship Samsung devices giving the Galaxy J7 that premium feel. It's also relatively slim making it easy to grasp, even with one hand. A thin bezel holding the 5.5-inch display in place allows you more space to enjoy your content. The top part of the front panel hosts the LED flash, earpiece, proximity sensor, and the front camera. The lower part hosts the physical navigation keys which include the recent apps key, the home key, and the back key. To blend in with the metallic frame, the buttons are also crafted from metal. The power/lock button sits on the right edge while the volume rockers sit on the left edge. The upper edge hosts the noise cancellation mic. On the lower edge, we have the headset jack, microUSB port, and the microphone. The back panel is sturdy and solidly built. One amazing thing about it is that it doesn't accumulate fingerprints. It has the hands-free speaker, back camera, and the LED flash. It can also be removed to access the battery compartment and the SIM and microSD slots. For videos and photo capturing related works, the Samsung Galaxy J7 is fitted with a 13-megapixel back camera with a wide f/1.9 aperture and a 5-megapixel front camera. To start off, the camera experience on the Samsung Galaxy J7 is the best you can get on a mid-range gadget within this price range. The camera app interface is intuitive with buttons conveniently placed for easy reach given the 5.5-inch display is quite large in hand. The camera app supports the quick launch shortcut; from anywhere - whether the phone is locked or you are deep inside an app, just double click the home key to launch the camera. The camera launches quickly, ensuring you don't miss capturing any beautiful moments, thanks to the powerful Octa-core processor. Camera performance is incredible with fine details in the captured photos. A LED flash is included on both front and back cameras, so capturing shots in low lighting settings is fully supported. The selfies captured by the front camera are good and crisp. You are also able to enrich your pictures by adding a few seconds of background sound. For an enhanced experience, the rear camera supports several modes. By default, the Auto Mode is enabled, it allows the camera to evaluate the surroundings and determine the ideal mode for the picture. The Pro mode lets you manually adjust the ISO sensitivity, white balance, exposure value, and color tone. You may also capture pictures in Panorama, Sports, Continuous shot, HDR, and Beauty face. The front camera performs incredibly on selfie and wide selfie - this is a wide-angle selfie to fit more people in the picture. You may also capture photos by gestures - where you raise your palm till the camera detects and automatically takes a picture after two seconds. Video capturing capabilities are on the top side. It captures 1080p videos at 30fps. Details are sharp, and color reproduction is great. For a mid-range gadget, I found the video quality to be amazing. It allows you to go live on social media sites like Facebook and Instagram with bliss. The 5.5-inch display on the Samsung Galaxy J7 is your portal to the digital world. This is a super AMOLED display with a resolution of 720x1280 pixels which gives a 267ppi (pixels per inch). As it is with Samsung smartphones, the Super AMOLED technology means vibrant color display. Viewing angles are great because the pixels retain brightness at different angles. While indoors, videos and pictures show up brightly. This being a mid-range gadget, outdoor visibility may not be as great as found on high-end devices. Although the ambient light sensor is missing, the phone has the Outdoors mode which kicks up brightness making it easier to see items on the screen. A major selling point on the Samsung Galaxy J7 is the battery life performance. It's a 3300mAh battery with up to 23 hours of talk time. This is among the longest lasting phones I have used. With video streaming at full brightness, the phone can last up to 7 hours, while on average brightness, the phone can last close to 10 hours. This is double the average time most phones in this price range lasts. The battery on the Galaxy J7 will last you a full day, whether you are browsing the internet or playing video. With moderate use, it could last up to two days. In case you are going out for long, you can easily swap out the removable battery with a spare battery. The Samsung Galaxy J7 has 16GB of internal storage with about 10GB available for your use. You may store thousands of photos on the device and still have more space for music and apps. Additionally, the phone allows memory expansion with an external microSD card of up to 256GB. The Samsung Galaxy J7 performs incredibly well. It ships with Android 7.0 Nougat and the Samsung TouchWiz UI running on top. The updated Android Nougat comes with better multitasking capabilities, security enhancements, and power-saving features. The TouchWiz UI brings in the unique Samsung visual components like the custom app icons, an altered notification panel and a different settings menu that makes the whole user experience fantastic. The phone is powered by a 2.2GHz Octa-core processor paired with 2GB of RAM. These resources are capable of handling all your daily activities. The Octa-core processor means you can multitask with multiple apps running in the background and experience no freezes whatsoever. The phone is very responsive even to the slightest touches. Apps launch at a considerably fast pace. I noticed how fast the camera app starts when using the shortcut of double tapping the home key. For the gaming department, the Samsung Galaxy J7 has the Mali-T830 GPU which performs well for a midrange smartphone. With expandable storage capability, installing large capacity games on the phone is not a problem. The aforementioned power saving features include Power Saving mode and the Ultra power saving mode. The Power Saving Mode turns off network connectivity and reduces performance while the Ultra Power Saving mode sets the phone to black and white. This ensures that your phone stays on for even a full day when the battery capacity is at a minimum. For other typical connectivity, the phone has Wi-Fi and Bluetooth 4.2. It also has NFC for quick and secure payments in supported stores. Overall, for the price the Samsung Galaxy J7 comes with, it offers great value for the money. We are using the Republic Wireless as our service provider. This is basically, a mobile virtual operator offering affordable mobile phone services. To keep the phone costs low, Republic Wireless relies on Wi-Fi hotspots spread across the country, with Sprint or T-Mobile cellular networks as the backup. It guarantees a wide and strong nationwide coverage whichever side of the country you are. A major advantage to this is the way it tries to give you a better connectivity and call experience even if you ended up in the deep of a building where cellular signal coverage is an issue. Isn’t that impressive? When there’s no Wi-Fi hotspot within range, it switches to the Sprint or T-Mobile network. Because of this ability to blend Wi-Fi and mobile networks, Republic Wireless boasts of delivering the best call quality. We discuss the wireless plans’ pricing options in a section below.Below is a list of specifications. 4G LTE / Wi-Fi / CDMA. Processor: Qualcomm Snapdragon 2.2GHz Octa-core. Camera: 13MP rear with flash. 5MP front with flash. Internal memory: 16GB. Supports external memory expansion with a microSD card of up to 256GB. Sensor types: Proximity, Accelerometer, Gyro, Geomagnetic, and Hall Sensor. $15 monthly; Unlimited Nationwide Calling and Texting. No contract. $20 monthly; Unlimited Nationwide Calling and Texting. 1GB Data at High Speeds. No contract. $25 monthly; Unlimited Nationwide Calling and Texting. 2GB Data at High Speeds. No contract. $30 monthly; Unlimited Nationwide Calling and Texting. 3GB Data at High Speeds. No contract. $35 monthly; Unlimited Nationwide Calling and Texting. 4GB Data at High Speeds. No contract. $40 monthly; Unlimited Nationwide Calling and Texting. 5GB Data at High Speeds. No contract. $45 monthly; Unlimited Nationwide Calling and Texting. 6GB Data at High Speeds. No contract. $50 monthly; Unlimited Nationwide Calling and Texting. 7GB Data at High Speeds. No contract. $55 monthly; Unlimited Nationwide Calling and Texting. 8GB Data at High Speeds. No contract. $60 monthly; Unlimited Nationwide Calling and Texting. 9GB Data at High Speeds. No contract. $65 monthly; Unlimited Nationwide Calling and Texting. 10GB Data at High Speeds. No contract. $70 monthly; Unlimited Nationwide Calling and Texting. 11GB Data at High Speeds. No contract. $75 monthly; Unlimited Nationwide Calling and Texting. 12GB Data at High Speeds. No contract. $80 monthly; Unlimited Nationwide Calling and Texting. 13GB Data at High Speeds. No contract. $85 monthly; Unlimited Nationwide Calling and Texting. 14GB Data at High Speeds. No contract. $90 monthly; Unlimited Nationwide Calling and Texting. 15GB Data at High Speeds. No contract. Click Here for Full Plan Details From Republic Wireless. $40 monthly; Unlimited Nationwide Calling and Texting, Unlimited Data (3GB Data at High Speeds, balance on lower speeds), No Contract. $55 monthly; Unlimited Nationwide Calling and Texting, Unlimited High Speed Data, No Contract. Click Here for Full Plan Details from US Cellular. $40 monthly; Unlimited Nationwide Calling and Texting, Unlimited International Texting, Unlimited Data (4GB Data at High Speeds, balance on lower speeds), No Contract. $40 + $30 monthly family plan for one additional line; Unlimited Nationwide Calling and Texting, Unlimited International Texting, Unlimited Data (4GB + 4GB Data at High Speeds, balance on lower speeds), No Contract. $40 + $30 + $30 monthly family plan for two additional lines; Unlimited Nationwide Calling and Texting, Unlimited International Texting, Unlimited Data (4GB + 4GB + 4GB Data at High Speeds, balance on lower speeds), No Contract. $40 + $30 + $30 + $30 monthly family plan for three additional lines; Unlimited Nationwide Calling and Texting, Unlimited International Texting, Unlimited Data (4GB + 4GB + 4GB + 4GB Data at High Speeds, balance on lower speeds), No Contract. $180 monthly family plan for five lines; Unlimited Nationwide Calling and Texting, Unlimited International Texting, Unlimited Data at High Speeds, No Contract. $30 monthly; Unlimited Nationwide Calling and Texting. Unlimited Data (500MB Data at High Speeds, balance on lower speeds). Unlimited text to over 200 international destinations. Carryover unused data into the next month. No contract. $40 monthly; Unlimited Nationwide Calling and Texting. Unlimited Data (3GB Data at High Speeds, balance on lower speeds). Unlimited text to over 200 international destinations. Carryover unused data into the next month. No contract. $50 monthly; Unlimited Nationwide Calling and Texting. Unlimited Data (7GB Data at High Speeds, balance on lower speeds). Unlimited texting to over 200 international destinations. Carryover unused data into the next month. No contract. $60 monthly; Unlimited Nationwide Calling and Texting. Unlimited Data (10GB Data at High Speeds, balance on lower speeds). Unlimited texting to over 200 international destinations. Unlimited calling and texting to Mexico & Canada. Carryover unused data into the next month. No contract. $75 monthly; Unlimited Nationwide Calling and Texting. Unlimited Data at High Speeds. Unlimited texting to over 200 international destinations. Unlimited calling and texting to Mexico & Canada. Mobile Hotspot. No contract. This Alpha Glass Screen Protector for Galaxy J7 resists scratches and shattering while maintaining touch sensitivity and display clarity. Ultra-slim, one-piece design, easy installation and maximum protection from drops, bumps and tumbles is what the Symmetry Series Case for Samsung Galaxy J7 offers. Its slim profile allows it to easily slip into pockets or purses. Available in 2 colors: Black, Saltwater Taffy. Ultra clear, sleek, protective and minimalist Samsung Galaxy J7 case has everything you need: a slim profile, military-grade drop protection, and UV yellowing resistant materials. Available in Clear and Sheer Glam. WindowSeat Auto Mount includes a heavy-duty locking suction base for mounting your smartphone hands-free at an eye level on your car's windshield or dashboard, putting your maps, apps and more safely in view and within reach. Five-bay charging dock for tablets, smartphones and other USB-charged devices, allows max-rate charging for up to five full-sized tablets simultaneously. Twenty is a digital amplifier for your speakers that receives Bluetooth or optical audio streaming from your phone, tablet or computer. It ensures high-quality streaming audio. Secure your smartphone right in front of you and enjoy a hands-free drive. The Trip Mount keeps your audio, navigation and phone calls right where you want them. The Mount includes a rubberized face for securely attaching onto your phone, and back molded teeth for gripping on vents. Power up your gadget as you drive. The Power Jolt Car Charger is designed for use with most Micro-USB compatible devices. It's shaped to allow easy plugging and unplugging. It is designed, engineered and tested for durability. Portable power wherever you go, whenever you need it. The Reserve Power Bank delivers up to 26,800 milliamp-hours of safe, dependable power for smartphones, tablets, wireless headphones and most other handheld devices with the option of charging via USB-C or via a standard USB. It supports quick charge for devices that are compatible. The rechargeable Lithium-Ion Battery can charge from any wall charger, car charger or laptop with the included charging cable.